Leonardo da Vinci’s masterpiece the "Mona Lisa" was attacked with a mug earlier this month, but the world’s most famous painting — protected by thick glass — emerged with its enigmatic smile undimmed. 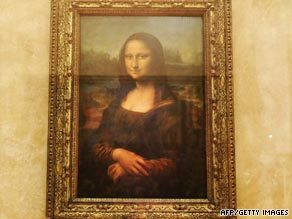 French police say a woman “not in her senses” lobbed the mug at the 500-year-old painting, which hangs in the Louvre gallery in Paris. The woman, a tourist, was later transferred from police custody to a psychiatric unit, a police spokesman told CNN. The spokesman declined to be identified, and did not say where the woman was from. The “Mona Lisa,” considered one of the world’s most valuable paintings, sits behind bulletproof glass in a special wing of the Louvre, attracting visitors in their millions. The Italian Renaissance masterpiece, which depicts a dark-haired young woman with an aloof facial expression, has been the target of attacks in the past. In 1956 the artwork was damaged when acid was thrown at it. A rock was also thrown in a separate incident in the same year. In 1911 it was stolen from the Louvre but was returned two years later.